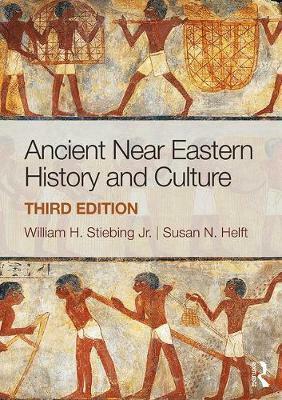 Author(s) Stiebing Jr., William H. ; Helft, Susan N.
Organized by the periods, kingdoms, and empires generally used in ancient Near Eastern political history, Ancient Near Eastern History and Culture interlaces social and cultural history with a political narrative. Charts, figures, maps, and historical documents introduce the reader to the material world of the ancient Near East, including Egypt. The emphasis on historical debates and areas of uncertainty helps students understand how historians use evidence to create interpretations and that several different interpretations of history are possible. Reorganization of the chapters on the early periods, with discussions incorporating the latest archaeological finds. New "Debating the Evidence" sections discussing current controversial issues in Near Eastern history. These sections make it easy for students and teachers to find and use the portions of the text devoted to scholarly arguments about various aspects of ancient Near Eastern history. A new chapter, "Ancient Israel and Judah," has been added to cover more completely the crucial issues of ancient Israelite history and religion. More emphasis has been placed on the role and contributions of women in the ancient Near East. The most important change is the addition of co-author Susan N. Helft, a specialist in the art and archaeology of the ancient Near East, who has applied her considerable knowledge, insight, research, and editing skills throughout the book. This new edition of Ancient Near Eastern History and Culture will remain a crucial text for students beginning to learn about the fascinating civilizations of the Near East.